A sexually active male Hynobius nigrescens during the aquatic phase of the March breeding season (dorsal view). Scale = 2 cm. Such an increased head width (arrows) is unknown in urodeles other than hynobiids, as the head of the male, as well as the body and tail, becomes swollen and inflated with water during the aquatic phase (Hasumi and Iwasawa, 1990). In contrast, a head shape of the male during the terrestrial phase is the same as that of the female in both phases. 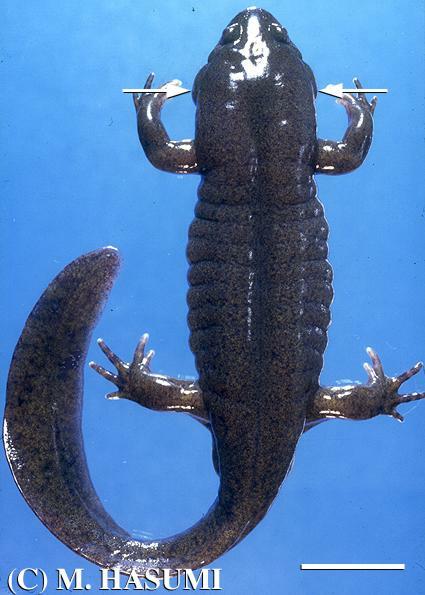 Because body mass, head width, and tail height of male H. nigrescens fluctuate seasonally, these characters are inapplicable to taxonomic purposes. A tubercle at the anterior angle of the vent is evident in adult male H. nigrescens throughout the year except from May-July when ventral glands are underdeveloped (Hasumi et al., 1990), but is always lacking in adult females (Hasumi, 1996). The mean snout-vent length (distance from the tip of the snout to the posterior angle of the vent) of 96 males is approximately 84.0 mm, and no significant difference is found between the sexes, in a population of Iwamuro-mura, Niigata Prefecture, Japan. Copyright 2002 Masato Hasumi, Dr. Sci. All rights reserved.